Sprint is coming out with probably one of the best phones one would see around. Its the HTC Evo 4G with everything packed in at a high configuration, and with an excellent design. Its an HTC’s WiMax powered Android device, that comes with 8-megapixel camera and it also has a 4.3″ screen. The only thing one won’t be impressed with, is the dual-band CDMA handset. GSM option would have made it more cool. The HTC Evo 4G is also called as HTC Supersonic, and will be supporting both 3G and 4G. 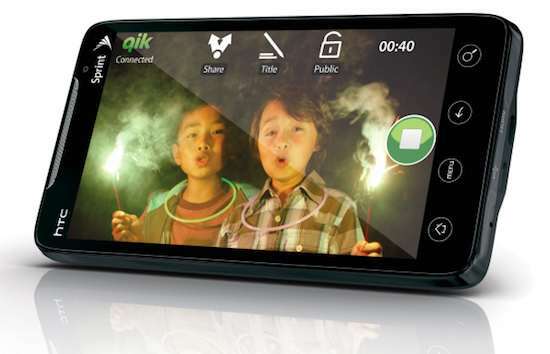 Its got 2 cameras: Back camera – 8-megapixel with dual-LED flash. Front camera – 1.3 megapixel for video calling. They work the best for streaming videos in 3D and 4D networks. The 8 megapixel camera is capable of recording 720p HD quality video. 3.5 mm headset jack, and the memory is expandable upto 32 GB expandable slot. Leap – The new feature to make multitasking possible in Android 2.1 OS. The phone is going to launch on June 4th, but you can pre-order it at Best buy. Its going to be one of the best specified phone in this year, with all the advanced features fitted in. HTC EVO: Will it give a lethal blow to Nexus One and a tough competition to iPhone4? I personally think it is going to hit Nexus One very hard…. Looks like a delicate darling. Only things of issue are 1.) alarm clock got no pop up to dismiss or snooze the first time I used it. It’s already been fine since then but wow- that was interesting. Had to turn it off to stop the song! 2.) One day, all my imported (at Sprint store) contacts disappeared. Only the ones I had hand loaded directly remained. I lost ~ 113 names, numbers that I have no plan how to get back. They are not in my gmail or anything..